Storage injections need to be maintained this month as well. Gazprom exports to EU increased by 14% in August compared with July and by 2.7% compared with August last year as EU storage needs to be replenished. 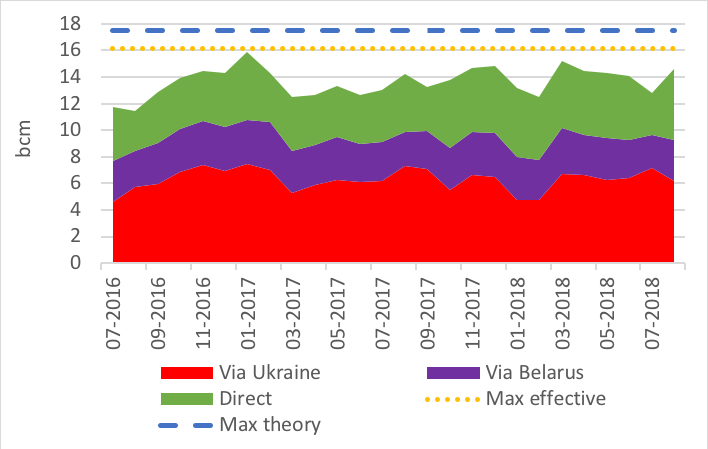 After the scheduled maintenance on Nord Stream 1 between 17 and 30 July, direct flows to the EU increased by 68% in August compared with July as Gazprom rightly prefers for economic reasons to use Nord Stream 1 as it pays the Ukrainian transit fees on a volumetric basis. Hence flows through Ukraine fell by 13.5% compared with July. Comparing Q2 2017 and Q2 2018, volumes are up by 6.5% and prices up by 24%. The growth in physical export flows for EU as calculated here on a monthly basis is 2.4bn m³ for H1 18 vs H1 17. Gazprom includes Turkey in Europe, but we exclude it from our EU data; and physical exports do not differentiate between effective sales and gas put into storage. Hence, we should continue to see in September an increase flows as storage (that is still not as full as last year) needs to be refilled before the coming winter season. On top of that, the definitive closure August 15 of the UK Theddlethorpe gas terminal after 45 years of operations will cost the UK about 2% of its overall production. With Rough also closed, this means that the UK will need to call more gas either via pipes (IUK, BBL) or LNG in the coming winters. 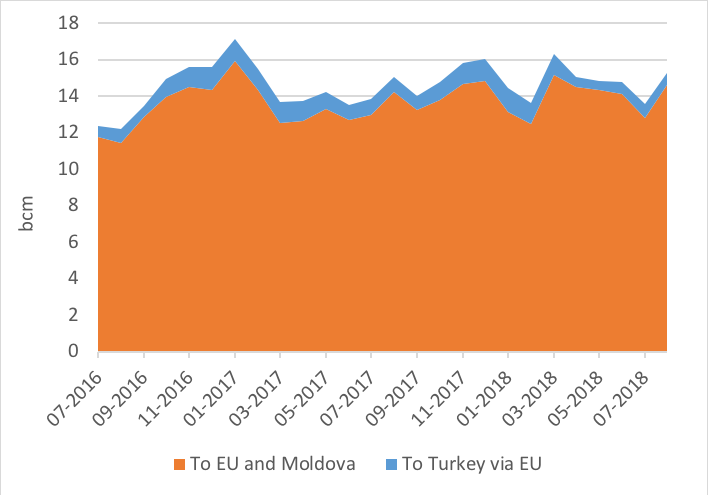 Those Gazprom half-year sales growth are higher than the anticipated demand growth: for the 20 EU countries having reported until June, Jodi data base has no demand growth; only Turkey witnessed a growth in demand. We can therefore estimate that in the EU-27 (ie post-Brexit), Gazprom's market share is moving up from its 34% recorded in 2017. Remember, the best way to avoid looking at Gazprom’s market share is to follow the strange reasoning of the German official statistic body BAFA that states ‘for data protection reasons, imports are no longer reported by country of origin’! Fortunately, Gazprom, as an international listed company, provides timely and accurate data. As all August Entsog data flows from Bulgaria to Turkey are at the time of writing not available, the missing data have been estimated.